With "Sans titre (des corps entassés)" and "An Italian Film (Africa Addio)" (both 2012), Mathieu K. Abonnenc seemingly presents a series of copper sculptures and a film on their production. 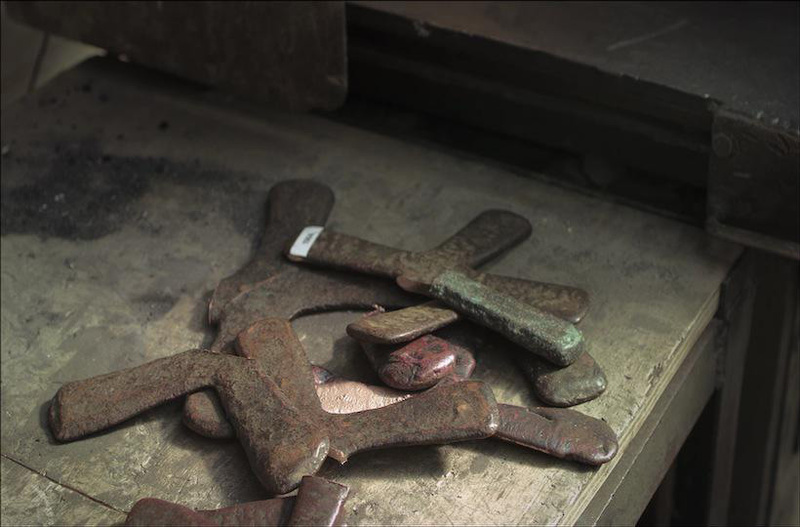 A closer look points to the use of a pre-colonial currency from the Congo that is transformed in this casting process: In order to become an abstract work of art, the so-called ‘Katanga’ crosses are cut into pieces, melted and redesigned. The titles of both works point to violations of human bodies in mass killings and in film history (Gualtiero Jacopetti and Franco Prosperi, "Africa Addio", 1966) that are kept invisible in the work. May the destruction of objects allow understanding the violence of colonial and racist exploitation without reproducing the misuse of bodies? May the resonance between archival materials, minimal sculpture and film narrative permit a complex historical context to become present? The artist and art historian Susanne Leeb are invited for a discussion, focusing on the gestures of gradual transformation of matter through artistic proceedings. It will be debated how, when put at work, matter in transformation may allow resenting zones of unrest and mourning. Through video, photography, installations, and drawing, Mathieu K. Abonnenc (born 1977 in French Guyana) focuses on the cultural hegemonies in contemporary societies and interrogates elements of imperial history and its postcolonial aftermath. Selected recent solo exhibitions: MMK Frankfurt, Kiosk Ghent, Kunsthalle Basel, Bielefelder Kunstverein, Fondation Serralves, Porto / Susanne Leeb is an art historian teaching at Leuphana University in Lüneburg. Her work deals with intersections of contemporary art, art history, ethnography and colonial histories.